Product prices and availability are accurate as of 2019-04-16 12:07:42 EDT and are subject to change. Any price and availability information displayed on http://www.amazon.com/ at the time of purchase will apply to the purchase of this product. Came-TV modular cage is designed to fit the Sony A7RII and Sony A7sII perfectly. The Sony A7RII and A7SII share the exact same body dimension. This cage provides easy access to the battery allowing you to replace it without removing the camera from the cage. CNC Machined from aluminum this cage is light weight and very strong. There are lots of threaded holes on the cage to attach accessories. The Deluxe Edition features a reversible top handle detailed with wood for warm comfortable fit. In addition the plush finished side handles are vertically adjustable via the dovetails and rotationally by the locking rosettes. The included base plate and handle have 15mm rod hole(s) which allows for mounting accessories and expanding the rig. 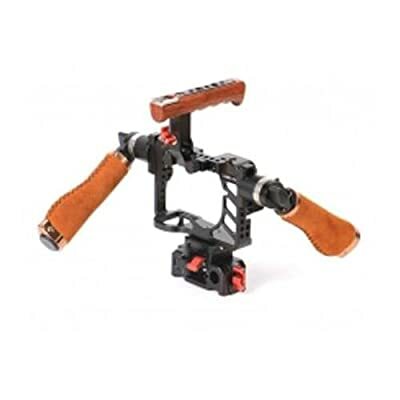 The cage comes with cable locks for HDMI and USB cables to protect your camera from damage. The new Sony A7s II can be powered from a basic USB Battery, but in order to keep your camera safe from damage it is important to lock the cable from any movement.